As an organization, Tec-Refresh is always looking for best solutions to help them grow. They were in need a marketing application that will help promote their business while allowing their team to focus on their core strengths. They needed the sales team to sell, the marketing team to market, and the sales engineers and engineering team to focus on technology design and implementation. Marketing automation is essential for Tec-Refresh teams to stay focused and minimize the administration of marketing programs. Tec-Refresh is striving stand out and build a stronger online presence. The key to differentiating their organization from the many other technology service providers is for Tec-Refresh to build the perception of thought leaders and promote their innovative solutions in a way that sets them apart from their competitors. ContentMX has enabled Tec-Refresh to establish market differentiation by making it easy to create original content and curate high-quality, relevant content that can be directly posted to their blog and website, and produces content-rich communications as part of their strategy. Also important is the ability to immediately share that same content on social media to spearhead conversations with prospects and customers. Tec-Refresh is using ContentMX to post directly to LinkedIn and Twitter through both personal and professional profiles. As a result, they have seen responses from peer groups and new prospects as well as new inquiries on the website. Easy access to quality original and curated content is what brings success to Tec-Refresh. In addition to sharing the content, ContentMX has enabled Tec-Refresh to run campaigns that generate leads and allow for direct follow up. 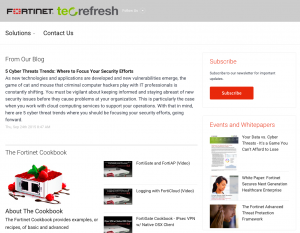 For example, the Fortinet Cyber Threat Assessment campaign allowed Tec-Refresh to target a large group of prospects with a free assessment program. Having immediate and direct access to white papers and original content was critical to this process. Tec-Refresh content on a ContentMX hosted microsite drives new traffic and captures leads. The ease of using ContentMX is saving Tec-Refresh the time that was previously spent on administrative tasks, giving them more time to focus on selling. The platform makes it easy to post original and curated content as well as have full control over what is posted to their blog. Tec-Refresh is also able to target content for the sections of their website where it is most relatable, improving the quality and effectiveness of their web presence. Since engaging with ContentMX, Tec-Refresh has seen a significant uptick in the number of new prospects as well as an uptick in the number of add-on sales that have doubled its business. Tec-Refresh has been able to use the ContentMX Cloud to communicate with customers and bring them back into the fold for new conversations.